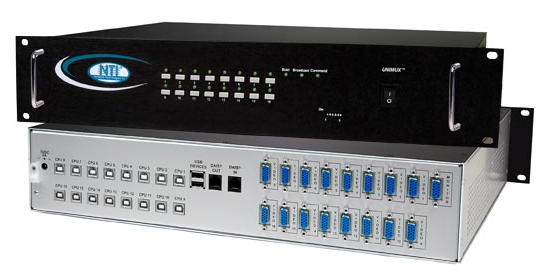 The UNIMUX™ VGA USB KVM Switch allows a user to control up to 32 USB computers with one USB keyboard, USB mouse and VGA monitor. Dedicated internal microprocessors emulate keyboard & mouse presence to each attached CPU 100% of the time so all computers boot error-free. Also known as: Industrial USB KVM switch, usb kvm switch, UNIMUX usb kvm switch, usb switch, universal serial bus kvm switch. Features NTI's patented true autoboot USB switching – all attached USB PCs, MACs and SUNs can be booted simultaneously. Compatible with SUN T1000, SUN 1000, SUN V210, SUN Fire™ V240, SUN Fire V20z, and other USB-enabled SUN computers. Compatible with MAC G4/G5 and Xserve. Supports MAC soft (keyboard) power-on. Fully compliant with USB standards (1.0, 1.1). USB MAC and SUN start-up keys are supported. SUN extra keys are emulated on USB keyboards with Windows keyboard layouts. 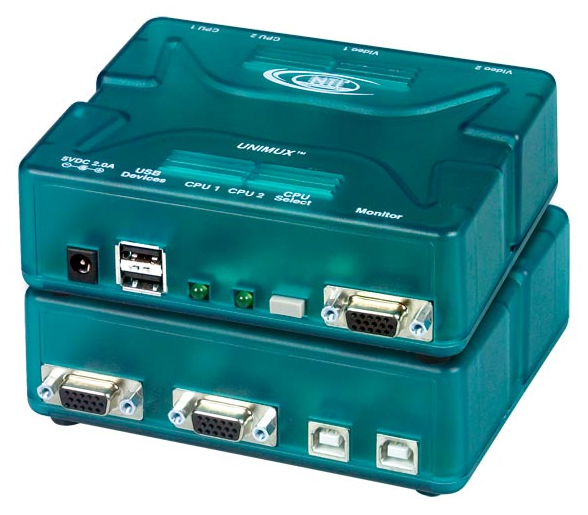 Available with audio or RS232 control options. Supports international keyboard layouts in auto-detection mode. Two female 15-pin HD and two female USB Type B connectors. Supports USB-enabled PC, SUN and MAC computers with VGA video. Any legacy PS/2 or SUN computer can be connected by using a USB-PS2-R or USB-SUN-R adapter. Crisp and clear resolution up to 2048x1536. Use the PWR-48V-5V1A DC-DC power converter to install the UNIMUX-USBV-2 in a Telecom environment. Compatible with most USB keyboards and mice, including wireless. Supports two USB devices directly connected. Supports up to eight USB devices using USB hubs (not included). Four female 15-pin HD and four female USB Type B connectors. 110 or 220 VAC at 50 or 60 Hz via AC adapter for UNIMUX-USBV-4O. 110 or 220 VAC at 50 or 60 Hz via IEC connector for UNIMUX-USBV-4ORS. Use the PWR-48V-5V1A DC-DC power converter to install the UNIMUX-USBV-4O in a Telecom environment. Add -48V5V2A, optional internal DC-DC converter to install the UNIMUX-USBV-4ORS in a Telecom environment. Eight female 15-pin HD and eight female USB Type B connectors. Multiplatform support: Windows 2000/XP/Vista/Server 2000/2003/2008, Solaris, Linux, FreeBSD, and MAC OS 9/10. Add -48V5V2A, optional internal DC-DC converter to install the UNIMUX-USBV-8O(RS) in a Telecom environment. 3.5 mm stereo audio jacks for inputs and output. Maximum input/output levels: 4Vp-p (line level). Total Harmonic Distortion + Noise: 0.02% at 1 kHz. Requires powered speakers or headphones. Sixteen female 15-pin HD and sixteen female USB Type B connectors. Use the PWR-48V-5V2A DC-DC power converter to install the UNIMUX-USBV-16 in a Telecom environment. Thirty-two female 15-pin HD and thiry-two female USB Type B connectors. Use the PWR-48V-5V4A DC-DC power converter to install the UNIMUX-USBV-32 in a Telecom environment. Touch a button and be connected to a computer, or change modes of operation. Select computers by name with the On Screen Display (OSD) option. Not available on the 2-port switch. Shows names of computers on cascaded switches up to 152 ports. View usage statistics – power-on cycles and hours of usage. Advanced security included with OSD option. Each user password can be up to 13 characters long, and each switch can store up to 63 users. Interconnect the UNIMUX™ USB KVM Switch, UNIMUX-USBV-x, with XTENDEX® USB KVM Extenders via CAT5, ST-C5USBV, to allow you to command up to eight USB computers located up to 1,000 feet away using CAT5 UTP cable. Control multiple computers connected to a UNIMUX USB KVM Switch using the RACKMUX KVM Drawer. Baud rate 300 through 9600, DIP switch selectable. Use DIP switches to address up to 15 units, all of which can be daisy-chained and controlled by one serial port. Seven segment displays show what input is connected to each output. RS – causes switch to reset so that IN1 connects to OUT1, IN2 connects to OUT2. CS – causes one INx/OUTx connection to occur. CA – causes all inputs to connect to specified output. RO – reads what input is connected to specified output. RU – reads size of matrix, reports number of inputs and number of outputs on specified switch. 3.5mm stereo audio jacks for inputs and output. Frequency Response: 20 Hz to 20 kHz, ±0.5 dB. Total Harmonic Distortion + Noise: 0.02% at 1kHz. The USB-PS2-R adapter connects a legacy PS/2 computer to an NTI USB KVM switch. Two female USB Type A and two male 6-pin miniDIN connectors. One-meter male USB Type A to male USB Type B cable is included. The USB-SUN-R adapter connects a legacy SUN computer to an NTI USB KVM switch. Two female USB Type A and one male 8-pin miniDIN connectors. "I would like to thank you, Phyllis and NTI, for all that you do for JEOL. We have been purchasing the UNIMUX-USBV-4O-RS since 2006. We find the NTI USB KVM switch to be a very reliable product, and will continue to purchase. We've had very minimal problems with the units over the years, and I hardly ever have to contact you for an RMA for repair. It is nice to have a dependable product, but it is equally as important to us to have fantastic customer service. You have been a wonderful rep to our company. You are kind, friendly and eager to help. You are quick with email replies. That is something that is very important to our company that makes us keep coming back. Keep up the good work. I look forward to a long relationship with you and your company." "This is just to thank you for the excellent service - the UNIMUX-USBV-8O KVM switch that I ordered arrived very quickly with excellent packaging. The installation was very simple and it is working faultlessly. 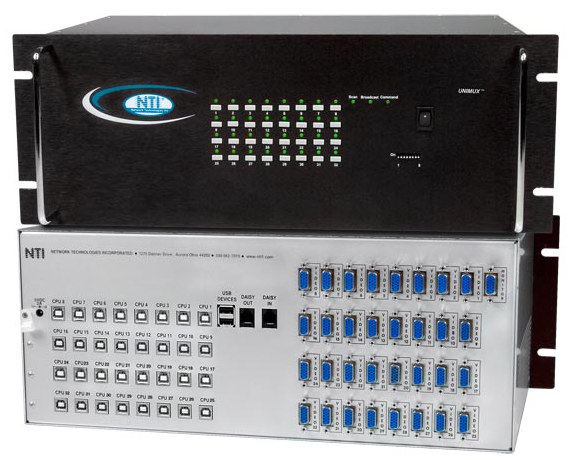 The experience with your company has been very good and we will continue to purchase our KVM solutions from NTI." "I just wanted to drop you a line and let you know how much we love our new UNIMUX™ system. We are a multimedia graphics and presentation company and in the course of our work we end up with some unique needs. A recent show for A&E networks is a good example. We needed to have eight computer laptops running four different power point presentations that would be displayed on eight plasma screens and be in sync with each other. Your UNIMUX-USBV-8O USB KVM Switch did the job of controlling the eight laptops in perfect sync beautifully. We're happy to add the UNIMUX switch to our inventory and look forward to using it again. Thank you for all your assistance in helping me choose and purchase the unit."